It includes both chemical and physical approaches to the properties of solids, and clearly separates those aspects of materials properties that can be tackled with classical physics from those that require quantum mechanics. * Quantum mechanics are introduced later to allow readers to be familiar with some of the mathematics necessary for quantum mechanics before being exposed to its bewildering fundamental concepts. * Discusses the electronic properties of solids from the viewpoint of elementary band theory, and end with a brief treatment of semiconductors and some semiconducting devices. 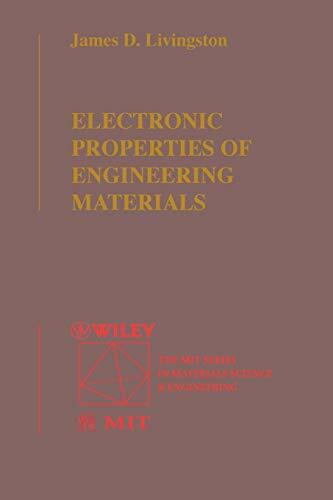 FINALLY, AN ACCESSIBLE INTRODUCTION TO THE ELECTRONIC PROPERTIES OF MATERIALS! Livingston helps make the complex concepts behind the electronic properties of materials much more accessible for students. His very readable writing style and clear organization help to make the key topics much easier to understand. The first part of this text presents only “classical” ideas, covering the electronic properties of solids that are pertinent to the use of materials as components in various products. The second part introduces Quantum mechanics and applies Quantum chemistry and Quantum physics to the basic properties of metals, insulators, and semiconductors. This approach allows the student to become familiar with some of the mathematics necessary for Quantum mechanics before being exposed to the more challenging fundamental concepts. Quantum chemistry and Quantum physics are presented in a balanced approach. A strong focus is placedon optical properties of solids. Students will be especially interested on the coverage of color which answers everyday Questions from why the sky is blue to why the grass is green. Actual engineering applications are used frequently to show students the importance of the developments of math physics. After retiring from the Materials Department of General Electric’s Research and Development Center, Jim Livingston has been teaching undergraduate materials science at MIT since 1989. While working at GE, his research areas included hard and soft magnetic materials, high-field and high-temperature superconductors, dislocations, mechanical properties, and eutectic and eutectoid transformations. Livingston earned a Bachelor of Engineering Physics at Cornell University, and an M.A. and Ph.D. at Harvard University. Along with writing over 150 technical articles, he has also authored a monograph on the metallurgy of superconductors and a popular-science book Driving Force: The Natural Magic of Magnets. Jim is a member of the National Academy of Engineering, a Fellow of ASM International and the American Physical Society, and a member of TMS, MRS, AAAS, and the IEEE Magnetics Society.